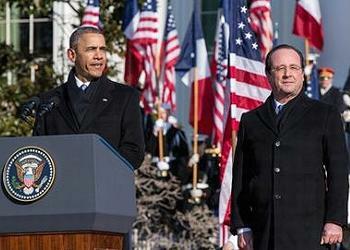 WASHINGTON, DC, February 11, 2014 (ENS) – The leaders of France and the United States today agreed to expand their work to curb climate change in advance of the United Nations climate summit next year in Paris, where the world is expected to forge a global climate agreement to take effect in 2020. “We want a serious and comprehensive agreement, one that will enable all countries – developing countries, developed countries – to work together towards a number of common goals,” said Hollande during a news conference at The White House. “Next year’s carbon climate conference in France will be an opportunity to forge a strong global agreement that reduces greenhouse gas emissions through concrete actions,” said President Obama. “Cooperation in the multilateral context will be essential in reaching an agreement that is consistent with science and includes ambitious mitigation contributions from the world’s major economies and other significant emitters. The United States and the European Union are both preparing robust contributions to further reduce their greenhouse gas emissions,” The White House stated. The United States is working with France on mobilizing financial and technological support to the most vulnerable and poorest countries. The promotion of incentives for clean energy must be complemented by reduced incentives for high-carbon energy sources, The White House said. The two leaders also are cooperating to fight hunger and disease throughout the world. 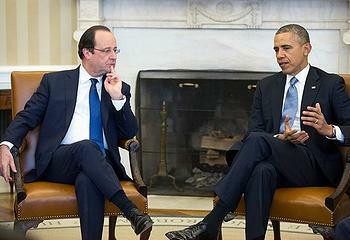 This work is based on a strong and growing trust between their nations, the two leaders said. In June 2013, President Obama released his Climate Action Plan, which outlines steps the United States will take to meet its commitment to cut greenhouse gas emissions in the range of 17 percent from 2005 levels and move the country onto a low-carbon growth trajectory. “Energy-related U.S. emissions are near their lowest levels since the mid-1990s,” the White House said in a statement. A senior White House official told reporters Monday that reducing and removing subsidies for coal-fired power plants was on the table during today’s negotiations. “Ever since the President outlined his Climate Action Plan, he’s been trying to put substantive policies in place behind that,” said the official who declined to be named. France is also a leader in addressing climate change, both within the European Union and globally, said The White House pointing out that France’s economy has one of the most carbon-efficient in Europe. The United States commends France’s progress toward meeting its “20-20-20 goals” to reduce domestic greenhouse gas emissions by 20 percent from 1990 levels by 2020, in addition to raising the share of renewable energy in its domestic energy mix and increasing energy efficiency. The United States commends France’s leadership in hosting the 2014 Solar Decathlon Europe, an award-winning program developed by the U.S. Department of Energy that challenges collegiate teams to design, build, and operate solar-powered houses that are cost-effective, energy-efficient, and attractive. The United States and France are committed to promote efforts to achieve a global nuclear liability regime based on treaty relations among France, the United States, and other countries that might be affected by a nuclear accident. The two countries share a commitment to advancing science and technology cooperation in energy, including mutually beneficial collaborations on nuclear fusion energy sciences, high-energy physics, and nuclear physics. The United States partners with France and countries in Africa to combat the illegal trade in wildlife and their parts and wildlife products. In particular, said the White House Press Office, the United States welcomes collaboration with France in Central Africa to promote regional cooperation and strengthen law enforcement capacity to counter poaching and wildlife trafficking. The United States also partners with France as part of the Congo Basin Forest Partnership to promote the conservation and sustainable forest management of one of the world’s largest tropical forests. Together, we are working with our partners to ensure a healthy future for these forests and wildlife as well as for the people who depend on them for their livelihoods. As stewards of the world’s largest and second largest maritime exclusive economic zones, the United States has longstanding collaboration with France in the area of maritime affairs, in particular with respect to the creation and management of marine protected areas.